One thing they drill into your head in business school is how to make everything a quadrant. While I don’t know for sure if it started with the famous BCG matrix — which groups business into dogs, cash cows, stars, and question-marks — I’d bet that the BCG matrix played a big part in initiating the quad-thinking movement. 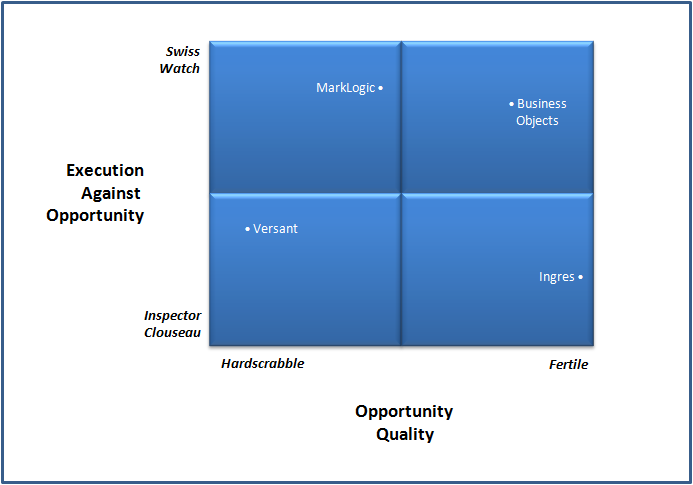 I’ve been toying with a quadrant lately that compares businesses based o n the quality of the opportunity they pursue and how well they execute against that opportunity. 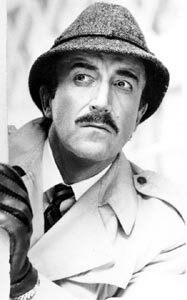 I rate execution from clownish (“Inspector Clouseau”) to flawless (“Swiss Watch”). I rate opportunity quality from difficult (“Hardscrabble”) to easy (“Fertile”). Please let me know what you think of my model, what you think of my placements, and what other companies you’d place where on this diagram. In addition, if anyone has clever names for the four quadrants themselves, I’d love to hear them. Some folks have commented to me over email that they disagree with my placements of the companies. My first-order explanation is that the placements are (1) my opinion as an employee, (2) during the time period at which I worked for the firm. For example, one person disagreed with the BOBJ placement based on the 2004-2007 time period, but that was after I left — and thus I have relatively little idea of where I’d have placed it had I worked there. I’d put Salesforce.com in the same quadrant as BOBJ. I have a question though – How is “Opportunity Quality” different from the following? On Salesforce, I think I agree. On opportunity quality, I’d say proven-ness is different from opportunity quality — i.e., there are quality opportunities that are in unproven markets. I think that over time proven-ness becomes a good surrogate — e.g., when I joined BOBJ in 1995, I thought it was a quality opportunity but — at $30M — it was not proven that it was going to be a N $B market. But I get your point. Over time, quality opportunities turn into proven markets. * What would you say are the characteristics of a “quality opportunity”? * i.e. What characteristics made you think (correctly!) that BOBJ was a quality opportunity in 1995? In three words: obvious market need. As noted in the above-linked article, a company pursuing a “fertile” opportunity with poor execution sounds like a perfect description of a turkey “flying” only because of a strong wind. I suggest the opposite of a flying turkey is a crow: Crows are able to thrive within difficult, messy environments. What a coincidence, I blogged about the virtues of “crow” businesses here. :-) I would place successful ETL vendors in this quadrant. So that leaves two quadrants left to name: poor executors in tough markets (a flightless bird of some kind seems appropriate; both unlikely to survive all that long) and good execution in fertile markets probably should be the quadrant for “eagles” – they will make the most of the “wind” of a great opportunity and still fly after the turkeys hit the ground. Love it! Crows, Eagles, Turkeys, and Dodos. Thanks for thinking of cross-referencing the two sources.